Who wins when five driving instructors from the Emergency Vehicle Operations Center test the all-wheel-drive capabilities of the most popular mid-size SUVs? The five driving instructors at the Emergency Vehicle Operations Center teach police, firefighters, and other first-responders how to deal with the toughest road conditions imaginable. They took the five top mid-size SUVs and put them to the test in extreme all-wheel-drive conditions. Who wins? The drivers are, Darren, Director of Training Emergency Vehicle Operations Center, a former SWAT member, Craig, Driving Instructor, a former police officer, Chappy, Driving Instructor and Paramedic for 27 years, Dan, Driving Instructor, 21 years in law-enforcement, and Joel, Driving Instructor, in law enforcement 23 years. Each of the seasoned drivers got behind the wheel of the 2014 Subaru Forester, Ford Escape, Toyota RAV4, Mazda CX5 and Honda CRV. Each were put through a barrage of tests both on and off-road. They tested the popular SUVs on the curves and found the Forester had the least body roll and felt firmly planted around the corners. They could tell the all-wheel-drive system was at work. With the other SUV’s systems, they couldn’t tell if they were working. The next big test took the vehicles off-road to see how the systems performed first in the dirt. The drivers were especially impressed again with the Subaru Forester with it’s X Mode and its Hill Decent Control. It automatically applies braking to help the driver stay in control while descending steep hills in adverse terrain. Here’s how the professional driving instructors from the Emergency Vehicle Operations Center rated the five popular mid-size SUVs: First was the Subaru Forester, 2nd Ford Escape, 3rd Mazda CX5, 4th Toyota RAV4, 5th Honda CR-V. 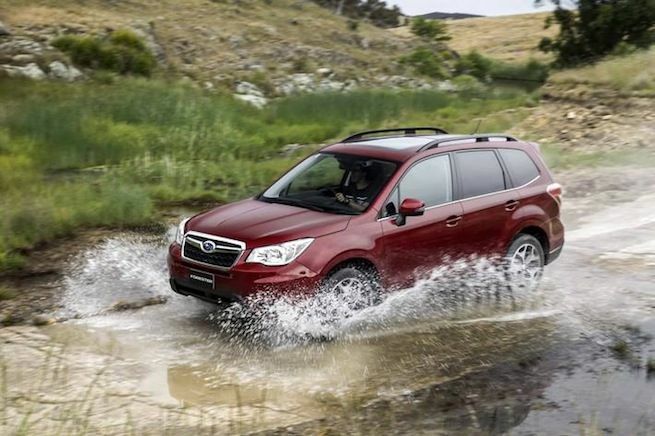 The all-new 2014 Subaru Forester with its Symmetrical all-wheel-drive is the best among the field and beats all the competition. Especially if you want to have extreme fun in the dirt. Watch Crossover Challenge - AWD video. Keep tabs on the oil level of that Subaru. Looking around it sounds like they still haven't fully addressed the oil consumption issues on the Subi's.